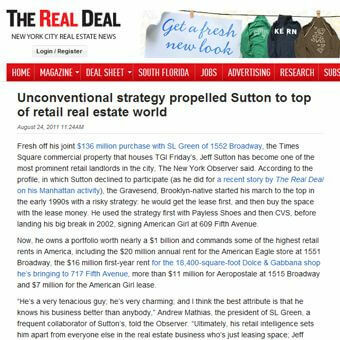 Fresh off his joint $136 million purchase with SL Green of 1552 Broadway, the Times Square commercial property that houses TGI Friday's, Jeff Sutton has become one of the most prominent retail landlords in the city, The New York Observer said. According to the profile, in which Sutton declined to participate (as he did for a recent story by The Real Deal on his Manhattan activity), the Gravesend, Brooklyn-native started his march to the top in the early 1990s with a risky strategy: he would get the lease first, and then buy the space with the lease money. He used the strategy first with Payless Shoes and then CVS, before landing his big break in 2002, signing American Girl at 609 Fifth Avenue. Now, he owns a portfolio worth nearly a $1 billion and commands some of the highest retail rents in America, including the $20 million annual rent for the American Eagle store at 1551 Broadway, the $16 million first-year rent for the 18,400-square-foot Dolce & Gabbana shop he's bringing to 717 Fifth Avenue, more than $11 million for Aeropostale at 1515 Broadway and $7 million for the American Girl lease. "He's a very tenacious guy; he's very charming; and I think the best attribute is that he knows his business better than anybody," Andrew Mathias, the president of SL Green, a frequent collaborator of Sutton's, told the Observer. "Ultimately, his retail intelligence sets him apart from everyone else in the real estate business who's just leasing space; Jeff understands the mentality of his customer."